While American technological and political achievements are numerous, few are as resonant as the great Space Race of the 1960s. This included the Mercury, Gemini, and Apollo space programs that reached their triumphant apex with the Apollo 11 mission that saw astronauts Neil Armstrong and Edwin “Buzz” Aldrin land on the moon and their safe return, along with command module pilot Michael Collins, to Earth. The United States Mint is releasing a seven coin commemorative program to mark the 50th Anniversary of the Apollo 11 mission and the moon landing. The series will have broad appeal for numismatic collectors as well as technology and space buffs alike. Commemorating the 50th Anniversary of the Apollo moon landing is really an attempt to capture the vibrant spirit of the Sixties and of the extraordinary achievements of America and Americans. The “one small step for man… one giant leap for mankind” celebrated with these commemorative issues, will live on as one of the most powerful and truly amazing moments ever achieved in human history. The space race effectively began after John F. Kennedy’s “We choose to go to the moon, not because it is easy, but because it is hard” speech given in Houston in 1961. In that speech, the President laid out his plan to land a man on the moon and return him to Earth, before the end of the Sixties. The Soviets had previously had achieved the manned spaceflight milestone and were effectively leading the so-called “Space Race,” when Kennedy declared one of the most epic efforts in the history of mankind. The Space Race and the Apollo mission are not only pivotal events in the history of the United States and mankind in general, but are also personally important to many Americans whose formative years were impacted by those events. Few moments in history capture the spirit of an age, or the energy and wonder possessed by a generation, like the Apollo 11 Moon Landing. Savvy collectors curate their collections to include unique or notable coins: odd denominations, issues with low mintage or limited availability, as well as coins that capture a moment in time and the achievements they represent. Notable coins like these, are the hallmarks and highlights of the best collections. 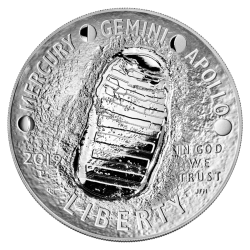 The common obverse of the Apollo 11 coin features the concave image of an American astronaut’s boot print on the moon. It was designed by Maine artist Gary Cooper who won the design competition. It was sculpted by U.S. Mint Engraver Joseph Menna. 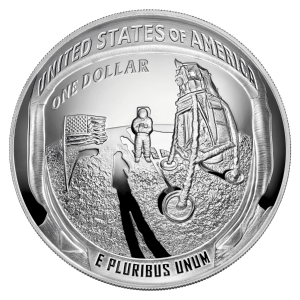 Inscriptions include “Mercury,” “Gemini,” “Apollo,” 2019, “In God We Trust” and “Liberty,” paying homage to the missions that proceeded the first successful moon landing as well as the country that launched it. The convex design is only the second time in United States Mint history that a curved coin has been struck. The first time was the exceedingly popular 2014 National Baseball Hall of Fame Commemorative Coins. The Apollo 11 50th Anniversary Commemorative Coin Program presented production challenges, due to not only the curvature of the coin design, but also in its striking and achieving the proper metal flow, to fully realize the beauty and details of the design. The curved design is attractive to collectors not only because it is the only the second appearance in a United States Mint issue, but also due to the way the curvature of the coin complements the design itself and the iconic imagery it commemorates. The $5 Gold Coin will bear the “W” West Point mint mark and be struck on a .242 oz .900 fine gold planchet. The mintage will be limited to a total 50,000 units comprising proof and bullion finishes. The Silver Dollar Coin will be struck at the Philadelphia branch of the U.S. Mint and will have the “P” mint mark. The coin will be struck in softer .999 fine silver due to production issues. It will have a mintage limit of 400,000 over all silver dollar product options. Both mint state and proof versions are available. The Clad Half Dollar Coin will be struck in both the Denver and San Francisco branch mints on standard cupro-nickel planchets and have a mintage limit of 750,000 units across all clad options, including mint state and proof. The Five Ounce Proof Silver Dollar Coin is perhaps the most intriguing coin in the series and is expected to sell out within minutes, according to U.S. Mint Director David Ryder. It will be struck on the same dedicated press that is used for the popular America the Beautiful 5 oz. silver coins. This issue is struck in .999 fine silver and will be limited to 100,000 units. The design of this piece was the most challenging of the coins in the series when trying to incorporate the curvature of the coin, and understanding the metal flow in the larger format 5 oz. planchets. Other design considerations included the capabilities of the press and accommodating the need for a uniform appearance over the entire coin series. It will be struck at the United States Mint in Philadelphia. Examples from the Apollo 11 Commemorative coin series will fit into extravagant or modest collections alike. This series has something to offer every collector, from those interested in gold issues or large 5 oz. coins, to the more casual collector who may still want a piece of this exciting history in their collection with the Clad Half Dollars. The wide variety of products in this series allow any level of collector to take part in celebrating the first steps that man took on the lunar surface. These Apollo 11 coins are deservedly expected to be popular with collectors. They give us the opportunity to celebrate one of the most truly outstanding American achievements in history. GovMint will be proud to offer all versions of the coins in this compelling Apollo 11 Commemorative Coin series. We will offer Numismatic Guaranty Corporation (NGC) graded MS70, PF70, MS69, PF69, UC, ER, FR, FDI and Gem examples in the Original U.S. Mint Packaging.